Link to YouTube for the Colour-Belt Patterns Performed by Master Suska. We recommend Master Suska as he is a Multiple Times World Champion amongst other impressive Titles that he has won over a very impressive career. Scroll down to see more information on the Colour Belt Patterns. 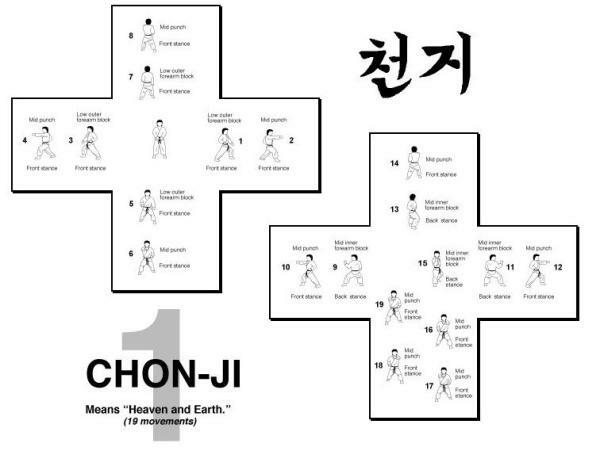 CHON- JI means literally ” the Heaven the Earth”. It is, in the Orient, interpreted as the creation of the world or the beginning of human history, therefore, it is the initial pattern played by the beginner. This pattern consists of two similar parts; one to represent Heaven and the other the Earth. 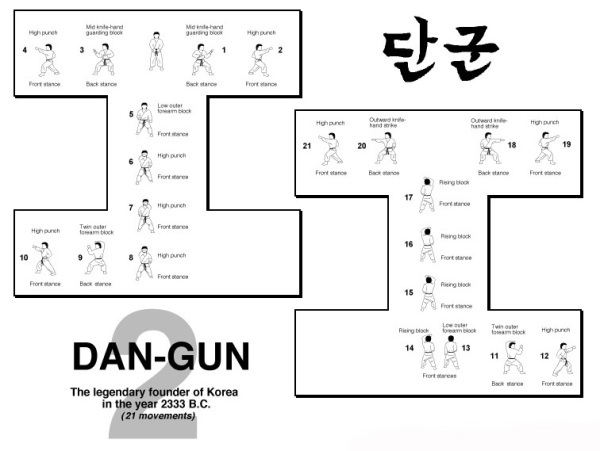 DO-SAN is the pseudonym of the patriot Ahn Chang-Ho (1876-1938) The 24 movements represent his entire life which he devoted to furthering the education of Korea and its independence movement. 4. Bring the left foot to the right foot and then move the right foot to A, forming a left L-stance toward A while executing a twin forearm block. 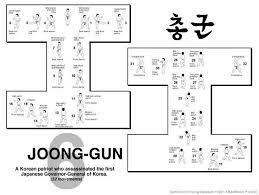 YUL-GOK is the pseudonym of a great philosopher and scholar Yi I (1536-1584) nicknamed the “Confucius of Korea” The 38 movements of this pattern refer to his birthplace on 38° latitude and the diagram represents “scholar”. 26. Lower the left foot to C forming a right L-stance toward C while executing a middle guarding block to C with the forearm. TOI-GYE is the pen name of the noted scholar Yi Hwang (16th century), an authority on neo-Confucianism. The 37 movements of the pattern refer to his birthplace on 37 latitude, the diagram represents ” scholar”. The illustrations for this pattern assume that the student is standing on the X and facing D.
6. Move the right foot to the side of the left foot and then move the left foot to D, forming a left walking stance toward D while executing a high hooking block to D with the left palm. Perform in a double stepping motion. 27. Move the left foot on line CD in a stamping motion to form a sitting stance toward F while executing a high side strike to C with the left back fist. 34. Lower the right foot, and then move the left foot to A to form a left L-stance toward B while executing a middle guarding block to B with a knife-hand. 35. Execute a middle punch to D with the right middle knuckle fist, bringing the left side fist in front of the right shoulder while forming a right L-stance toward D pulling the left foot. 38. Execute a low guarding block to C with a knife-hand while maintaining a sitting stance toward B. Perform 37 and 38 in a continuous motion. 19. Execute a low front snap kick to C with the right knee while pulling both hands in the opposite direction as if grabbing the opponent’s leg. 8. Execute a high outward block to D with the right outer forearm and a low blockto C with the left forearm while forming a right L-stance toward C pulling the left foot. 36. Move the left foot to D to form a left walking stance toward D while executing a high block to D with the left double forearm. 50. Bring the left foot to the right foot, and then move the right foot to E, forming a right fixed stance toward E while executing a 51. U-shape punch to E.
1. Move the left foot to D to form a right rear foot stance toward D while executinga middle guarding block to D with the forearm.